It's not unusual to be asked to include a resume when you fill out and submit a job application. Employers often request resumes in addition to job applications even though both documents will likely contain similar information so that they'll get a sense of how you approach marketing yourself and your skills. Make sure the impression your resume makes is a positive one. Before you start filling out job applications, you should have a quality resume put together to use. That way, you won't have to delay applying for jobs while you go through the process of writing and formatting a resume. Use one of these free blank resume forms or this Microsoft Word resume template if you you'd like to use a general template to help you get started. They will provide you with a general format to use as well as tips for what to include. These samples can be customized for any position or level of experience, and you can save, print and update them as needed. Depending on your circumstances or the type of work you are applying for, you may also find a field-specific or situation-specific sample to be helpful. The ones listed here are fill-in forms that you can save and print for your own use. Teacher: Download customizable templates for new teacher and experienced teacher resumes. Acting: If you are looking for work as an actor, one of the two sample resume formats provided here may work well for you. Event coordinator: If you are seeking a position as an event planner, this template may be a good option for you. It can also be customized for other hospitality-related positions fairly easily. Customer service: If you are applying for a customer service or call center position, this sample is a good one to consider. Homemaker returning to work: Use this sample resume if you have been out of the workplace for a period of time because you've been staying home with your children. Be thorough: Fill out the application in its entirety. Do not write "see resume" in blanks on your application form. The resume and application may go to two different people for review. Additionally, if you don't provide all requested information on your application, it's possible that it will be considered incomplete and you will not be considered at all. Proofread carefully: Be sure that your resume is free from any grammatical, typographical or factual errors when you turn it in. When an employer requests a resume along with an application, you can be sure that the hiring manager will review the document very closely. A well-written resume can really help you stand out in a positive way, but one that contains errors can keep you from being considered for jobs regardless of how qualified you might be. Use quality paper: Don't send in a printed resume on plain copier paper. Instead, use high quality resume paper in order to convey that you are an individual with the highest standards of professionalism. 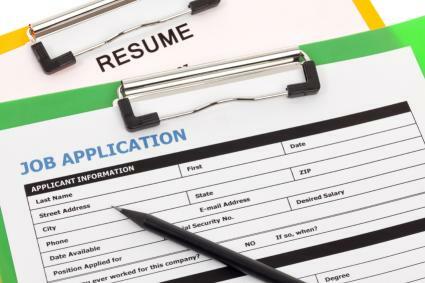 Keep resumes with you when filling out applications: When you are filling out job applications in person, be sure that you have a few printed resumes handy so that you can leave one with the applications that you turn in. Keep them in a sturdy folder or padfolio so that the individual sheets don't get wrinkled or bent. Mail in an 8 1/2 X 11 envelope: If you are mailing in a job application and a resume, that means you'll be sending in several pieces of paper. Rather than trying to cram them all into a standard #10 envelope, use an envelope big enough to slide all the pages inside it without having to fold them at all. Use resume keywords: If you are asked to copy or upload your resume into an online application system, it is important to use resume keywords effectively. This is because the document will be dumped into the employer's database, and hiring managers will use keywords to search for candidates who have specific skills or meet other criteria that they need. If the search terms they're likely to use aren't on your resume, it won't show up in their search results. Review format for online forms: If you are asked to copy your resume into an online form, copy and paste it from a word processed document that has been proofed carefully. Review the information for formatting after you paste it into the form, as any tabs, bullet points and other formatting features that you used will likely be stripped. Use the backspace, delete and return key to move the text around so that it flows effectively. Do not use the space bar to try to line up columns, as they will likely not stick. Instead, left-align the information so that it is easy for the hiring manager or recruiter to review. Proper upload format: If you are asked to upload your resume, be sure to use the particular format specified. If no format is specified, upload a PDF version of the document. If you are given several choices, one of which is PDF, it is always best to use a PDF file. This is because you won't have to worry about unintentional formatting changes as you resume passes from your machine to the company's online system. Use the correct method: If a job announcement says that you need to email your resume in support of your application for employment, look very closely to make sure you know whether you are supposed to send it as an attachment or in the body of an email. Many companies don't accept attachments to protect themselves from malware or for other reasons. Unless the announcement specifically tells you to send an attachment, copy your resume into the body of an email. Don't email word processing documents: A word processed resume that looks great on your computer could look entirely different (or even be inaccessible) on someone else's machine depending on their system settings, operating system and word processing application. If you are supposed to send your resume via an attachment, convert it to a PDF document before sending. That way, you can make sure that anyone can open it using a free PDF reader program (such as Adobe) and that it will look exactly the way you intended no matter what kind of system it is viewed on. Send a test email: Before you email your resume with a job application, whatever form you are using, email it to yourself so that you can be sure that it looks good when transmitted electronically. Make any changes needed, tweaking and re-sending to yourself until you are sure that it looks great when shared via email. Following these tips and using the sample documents provided here can help make sure that your complete application package really stands out in the applicant pool. You're sure to catch the attention of hiring managers or recruiters who are working to fill available positions that match your qualifications.